Merchants trust us to make payment processing simple, while providing the highest levels of professionalism and customer service. With cutting-edge technology and a high approval rate, First BankCard Processing makes it easy for merchants — even those with high-risk businesses — to process payments and accept credit and debit cards. We provide our merchants with the capabilities to accept and process all MasterCard, Discover Network and Visa cards, as well as gift cards, debit transactions, checks and other payments. Thanks to our competitive low rates, our merchants can enhance their cash flow and improve their bottom line. 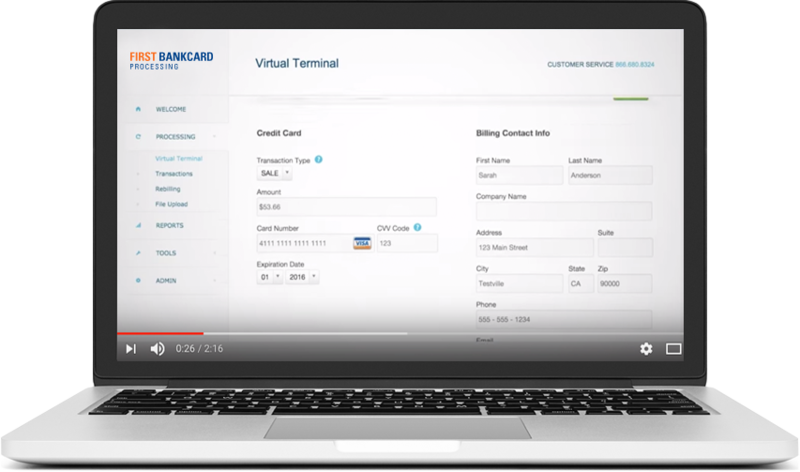 As a PCI-compliant processor, First BankCard Processing provides a payment processing solution that meets PCI standards to keep your information secure. Our payment gateway employs the latest encryption and processing technology to make sure our merchants get the best security and privacy possible, protecting credit card information and merchant account data. Most of our merchants can start accepting credit and debit cards within 24 hours of completing an application. We get your business up and running in three quick and easy steps, and once registered, our online management tool makes it simple and convenient to access and manage your account, check transactions, and organize your records and database.